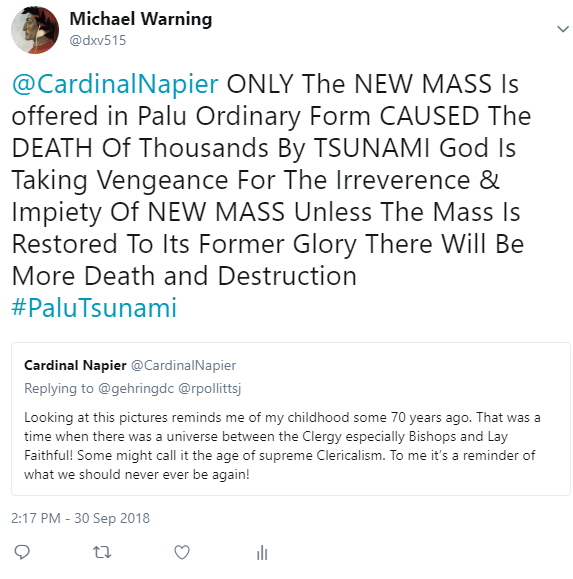 There are only three Catholic Churches in Palu and all three offer ONLY the Stripped and Barren New Mass. And he was withdrawn away from them a stone' s cast Lk.xxii. Consider first what every one must do in his troubles, to wit, he must stay, that is, expect patiently, and he must watch, that is, he must be careful that no evil happen unto him; for to an unquiet & troubled man many vicious and evil things are suggested. Consider secondly how unwillingly Christ left his disciples. For this word (drawn away) discribeth a violent pulling, and going, he went not far, but (as far as the cast of a stone) like as mothers are wont to go a little way from their young children, when they teach them to go, so as they may catch them again, when they are ready to fall. All these things declare the love of Christ, and his grievous inward sorrows, by which he was moved to pray unto his Father, that he might have some comfort from him. RAD TRAD FAIL! #StopTheSynod2018......FOUR DAYS TO DOOM! 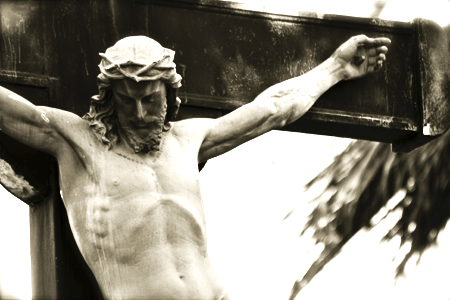 Then he saith to them: My soul is sorrowful even unto death Mt.xxvi. Let us weigh every word wisely: for he doth not say my soul is fearful, or I am weary of life, or my soul is doubtful, least he should seem to go to his passion rather against his will, then willingly:but he said (it is sorrowful) not only for the sundry causes of sorrow, but that thereby he might show that he was very man that suffered. My soul he doth not say I am sorrowful, because his will rejoiced and was desirous to die, but my soul, that is my nature, which never moved his will. Again, My soul that is, grief hath inwardly entered into my soul; lest perhaps you might think through the continual contemplation of his divine nature, that he felt no grief in his soul. Even unto death that is, either because that sorrow continued until his death, and no longer, or else because it was so vehement that mans nature could endure no more without peril of death. BLACK LIVES MATTER Shoot And Kill WHITE Memphis Chamber of Commerce President And Former Pinnacle Airlines CEO, Philip Trenary. he began to grow sorrowful and to be sad. Mt.xxvi. Because that sins are first committed in heart before they be done in work, Christ would suffer the sorrows of heart before the pains of body, that thou mayest know that he was grievously afflicted not only in body, but also in mind, and there are four principal kinds of sorrows assigned by the Evangelists, which Christ admitted of his own will in the Garden, and retained them even till his death. The first was a certain terror and fear of the most grievous pains now at hand, and also of a most terrible death, which nature always abhors beyond measure, & also of the sins of all man-kind which he took upon him in the Garden, and clothed himself therewith as with a garment weaved of all kind of filthiness, with which in the person of all sinners he must suffer the severity of God. GOSPEL Matt. 9:1-8 At that time, Jesus entering into a boat, passed over the water and came into his own city. And behold they brought to him one sick of the palsy lying in a bed. And Jesus, seeing their faith, said to the man sick of the palsy: "Be of good heart, son, thy sins are forgiven thee." And behold some of the scribes said within themselves: "He blasphemeth." And Jesus seeing their thoughts, said: "Why do you think evil in your hearts? Whether is easier, to say, Thy sins are forgiven thee: or to say, Arise, and walk? But that you may know that the Son of man hath power on earth to forgive sins," (then said he to the man sick of the palsy,) "Arise, take up thy bed, and go into thy house." And he arose, and went into his house. And the multitude seeing it, feared, and glorified God that gave such power to men.